David Whisler, online coordinator, has worked at The Dominion Post since 1999. 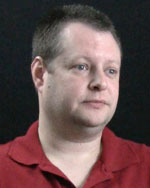 He oversees most of the online products and writes some of the code used for utilities and on the web sites. He also manages user accounts, security, and billing issues for the electronic edition. He serves as administrator for the web servers and performs assorted tasks for other departments. Whisler, a native of Morgantown, WV, has a B.S. in Computer Science from West Virginia University. He gained experience in software development, digital libraries, and web development before he started working for The Dominion Post. He took over the responsibilities for the free web content and was instrumental in switching the online newspaper to a paid digital replica format in 2005. David Whisler, online coordinator, The Dominion Post, has had to become a jack-of-all-digital-trades overseeing the newspaper’s online activities at his 25,000-circulation community newspaper. David Whisler, online coordinator, The Dominion Post says he believes newspapers may be offered in digital-only formats in the next 20 years, but not until the delivery platforms become cheaper, more portable and easier to use.